It’s not bad, though I think the pattern looks a little like upholstery. I am also not happy about the skips, although I think I will cut out the worst of them once I wet-finish it. Tomorrow I take up fringe-twisting again. I’ll take a more “official” photo once it’s fringed and wet-finished. Of course, this means that I got five pounds of nice cashmere for $5.94. Or just about 1% of its actual worth. I am smug. Tomorrow it’s back to the grind; in fact, tomorrow morning I’ll have to get up early and do the site review that I was supposed to be doing tonight. But dammit, it was worth it. Next up is the garnet weft. I am not certain I have enough warp to do a full shawl plus fringe, so I think I will finish this one with a hem and beads. Hopefully it won’t take me another four months to find the right beads for this one. 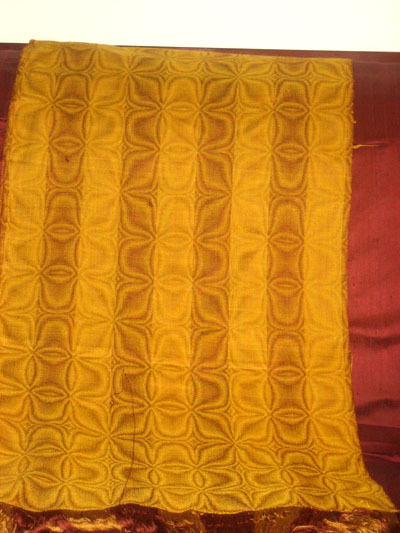 I plan to use the same pattern that I did for the goldenrod weft – I suspect it will look quite different, and I want to see how it does in garnet red.